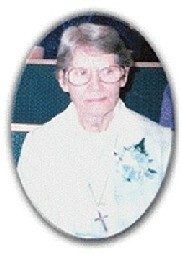 Sr. Rita Edge was born in Whiteville, Kentucky on August 2nd, 1922 of Catholic parents, Mr. and Mrs. Philip L. Edge. She came from a family of ten children of whom all are deceased. Sister grew up on a farm, a healthy environment and because of her Catholic up bringing, her inclination to Religious Life began early in childhood. In her teens an article in the Sacred Heart Messenger caught her attention and it turned out to be the key note of her vocation. She began thinking about becoming a missionary enabling her to follow her greatest desire, which was to always give honor and glory to God. On Feb. 15, 1945, she entered the Missionary Sisters of the Society of Mary in Bedford, MA. She made profession of the three vows on August 15, 1947. She gave community service for one year at Isabella St. Boston, MA. where our Sisters had a Religious article store. In September 1948, she received her overseas destination for Killara, Australia. From 1957-1962, Sr. Rita travelled the seas from one mission to another teaching in the schools on Bougainville island. Here she gave herself fully to enriching the minds and hearts of the children and the families she encountered. In 1962, she returned to the United States for her second Novitiate program, held in Lowell, MA. After this formation program, she returned to the South Pacific and this time she was sent to Erave Mission in the Southern Highlands of the mainland of Papua New Guinea, as a Religious Education teacher at the Catechist Training Centre. She remained there for three years and was then recalled to serve, once again to the Island of Bougainville where she continued her pastoral Ministry at a Catechist Training Centre. An ethnic crisis broke out on the island in 1990 and all the SMSM Sisters had to be evacuated. It was devastating for the Sisters to have to leave their people whom they had served for so many years and had become a part of the fabric of their lives. One can imagine how heart breaking it was for Sister Rita to return to the USA, but as a true religious, she was willingly accepted whatever assignment she was offered. After some time of community service at 62 Newton St. community in Waltham, she was missioned once again to St. Thomas Mission in the Virgin Islands. This ministry proved to be short lived as she began to experience difficulty with her eye sight and she had to return to Waltham, MA. for medical attention. With her background of retreat ministry and counseling, she was well equipped to care for the residents of Maristhill, which she did for many years. Her eye sight declined through macula degeneration, but she faithfully continued to serve without complaining. She was eventually diagnosed to be legally blind, but no one could notice it as she worked so very silently. When it became necessary to find an Assisted Living Facility for the Sisters residing at 62 Newton St. Waltham, she was among the first Sisters to move to Marillac Residence in Wellesley Hills, MA. on March 21, 2005. Needing more care by 2008, Sr. Rita moved to St. Patrick’s Manor in Framingham, MA. where she died on Feb. 3, 2009.